Saturday, April 27, is National Prescription Drug Take Back Day. This day aims to address public safety and public health by reducing the amount of opioids available and decreasing the likelihood of individuals developing an addiction. According to the 2015 National Survey on Drug Use and Health, 6.4 million Americans abused controlled prescription drugs. The study shows that a majority of abused prescription drugs were obtained from family and friends, often from the home medicine cabinet. 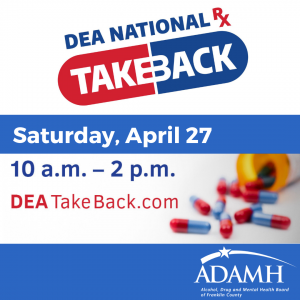 National Prescription Drug Take Back Day is April 27, 2019 – Check here for more information. Search by your zip code or city to find Controlled Substance Public Disposal Locations near you. For your privacy, it is recommended that you place the pills in a zip-lock bag and dispose of the bottle at home. Can’t make it out on April 27 and want to safely dispose of your medications now? ADAMH will mail a safe medication disposal bag to any Franklin County resident! Join Our Mailing List For Email Marketing you can trust.